Be devoted to the lord. Be scrupulous when killing living beings. Do not be afraid to die. These are the main principles of Bushi-Do. A. R. Basov, "Spirit of the Warrior"
A man whose profession is the use of arms should think and then act upon not only his fame, but also that of his descendants. He should not scandalise his name forever by holding his one and only life too dear. In Japanese gishi literally means "a decent person" – the highest title indicating the proficiency in an art or skill. This is said of a warrior that follows the Law of Giri. If you are able to see the good and bad sides of people, you will always hold true to your high principles. A true moral is the ray of Enlightenment. The samurai are the rulers, the enlightened warriors. The doctrine of their life is directly connected to their predestination. Rulers of all ages can learn a lot from the samurai. The samurai doctrine is simple: every member of the society must fulfill honestly their predetermined duty. If you are a ruler, be an honest ruler. If you are a bodyguard, protect your master to the last drop of blood. If you are a merchant, be decent. If you are an ordinary person, do what you are supposed to do in your position. Put lies aside, and the truth will triumph. Precious metals and jewels are not necessarily treasures. Rather, one should consider his samurai and the common people as his wealth and bring them up with gentleness and benevolence. The samurai are obliged to make the lives of their subjects better and protect them, even at the expense of their own lives. The samurai were established with the function to protect the three classes from disasters caused by the robbers and thieves, and were placed above the other members of society. There is no doubt that the function of the warrior is to bring peace of mind to the other members of society. Thus, it is unreasonable for men called warriors to act in unjust and excessive ways towards the other three classes. This goes without saying for those of high rank, but also concerns men of lower status. The samurai are entrusted with the duty of ruling society, and there is no excuse for ignorance. A samurai should learn constantly and train himself to be able to fulfill any duty. A person with a bit of wisdom is one who will criticize the times. A samurai is born to bring welfare. He must use his power for the well-being of other people. A warrior must clearly understand what complies with moral principles. All problems should be solved according to these principles based on giri – the sense of moral duty and honor. It is difficult to call a man who does not understand duty a warrior. If a warrior cannot serve with true dedication, he should not do it. If a goal is not worth sacrificing one's life, it is a false goal. Lord Ieyasu said, “The foundation for ruling the country in peace is compassion, for when one thinks of the people as being his children, the people will think of him as their parent.” Moreover, can’t it be thought that the names "group parent" and "group child" [i.e., group leader and member] are so called because they are attached to each other by the harmonious hearts of a parent-child relationship? Honor cannot be measured with arithmetic! Money is money and loyalty is loyalty. These are completely different things. Money is for financial matters, and loyalty can be preserved only by seppuku. That is all. A samurai ideal is a man who has never touched money because he considers it to be dirty. Understandably, such an ideal is difficult to achieve, but you should constantly keep it in mind. I do not need gold and silver. One cup of rice a day is quite enough for life. If you derived benefit from an evil deed, you should know that you have laid a foundation for your future misfortunes. Reward without merit is an unfair gift that inflicts misery. A warrior should always adhere to the principle of austere simplicity. He must not be enslaved by worldly goods or acquire material excess that waste one's time and energy. Even his own body, he must not overburden with muscles; otherwise he would serve the body and not the other way around. Whether a man becomes good or bad, clever or thick-witted, is simply a matter of the way he uses his mind. In this uncertain world, ours should be the path of discipline. Power entails responsibility. Serving society is the most difficult duty, and the ruler who honestly fulfills his duty performs a remarkable feat. But even the perfect becomes imperfect when it gets in touch with the imperfect. This is why the idea of self-isolation, microcosm and self-concentration was very popular in the East. The purpose of coming into the world is to accomplish one's duties. Serving society is a crucial idea in the Way of the Samurai. At the same time, a lot of great Masters lived in solitude, sometimes in a complete isolation, absorbed in selfdevelopment and self-perfection. A wise man avoids any confrontation and seeks to be in a harmonious relationship with the world. A vital role in that pursuit is the ability to be an independent, sovereign, self-sufficient person. One should always be genteel in his speaking. A man shows his inmost self by a single word. Bushi-Do incorporates the harmony of individualism and service to society, but serving society, though of exceptional importance, was not the primary purpose for a samurai. The most significant life is the one lived on the basis of a personal sense of justice and the desire to see justice realized everywhere. Rulers and their earthly concerns quite often run counter to the Laws of Heaven and may induce a warrior to do unacceptable things. A samurai must not act against his conscience or he would turn from a warrior into a murderer and become a tool in the hands of others. The samurai serve only one Shogun, the Shogun to whom they are absolutely loyal – the one who lives in Heaven. If you will take it into your mind to be sincere in throwing away your life for your master, you will not have the slightest fear or trembling even with the advent of innumerable impending calamities. A wise man lives according to supreme laws and looks indifferently at the laws created by human beings. Although the words "parent" and "lord", "filial piety" and "loyalty", are different, in the sincerity of the mind they are one. A samurai serves his principles. One of the core principles is loyalty. This is why if a samurai is in somebody's service, he remains loyal under all circumstances. Remaining loyal to his lord, a samurai first remains loyal to his principles. It is undignified to betray one’s principles. A samurai is a proud man. There is only one indisputable law for him – the law of honor. Honor comes before everything. Since being loyal is a matter of honor for a samurai, he considers everything before swearing allegiance. Loyalty is the key notion in the code of a knight's honor. A samurai's self-respect makes nonfeasance impossible. 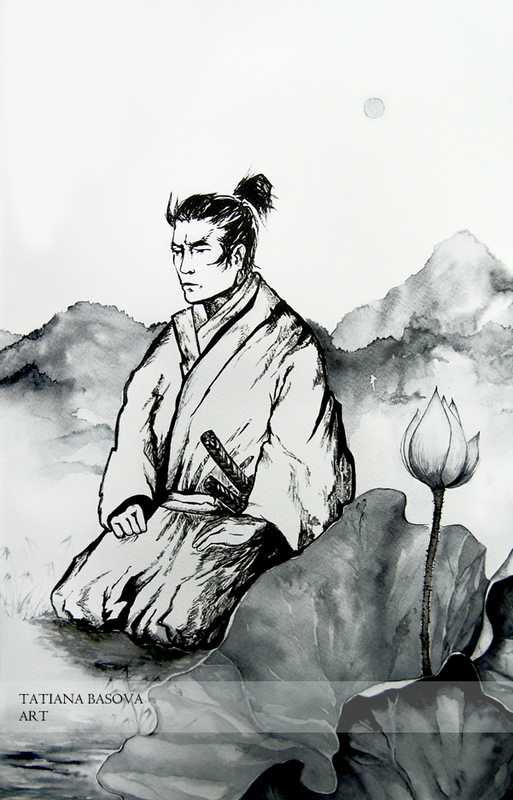 If a loyal samurai sees that his lord has fallen under the influence of a bad man – a flatterer and a hypocrite – and nothing can change his lord's opinion, the samurai must report this to higher ranking retainers and kill such a man, while being ready to accept the responsibility and commit seppuku. First of all, a samurai serves his principles, not persons. Serving the ideal is the core of Bushi-Do. Live judiciously, for you are born to be a human being!